Use our Family Planner Calendar template to raise money for your school, great value and easily sold to school members families. Great design with plenty of space for parents to record all those important school and family dates and events. This design is a fun and colourful design. The family planner calendar can be used to manage busy lives and families they are ideal for busy households and will look great in any home / office / school or business. Family planner calendar work best as an A3 size. Being A3 size maximises the space for writing all those dates. Our calendar design G is a calendar is A4 size when closed and opens out to A3 size (297x420mm). Each sheet is A4 size (210x297mm) wire bound in the middle and supplied with a hole drilled for convenient hanging on a wall. One month per page with four columns makes this family organiser an excellent calendar and fundraiser. 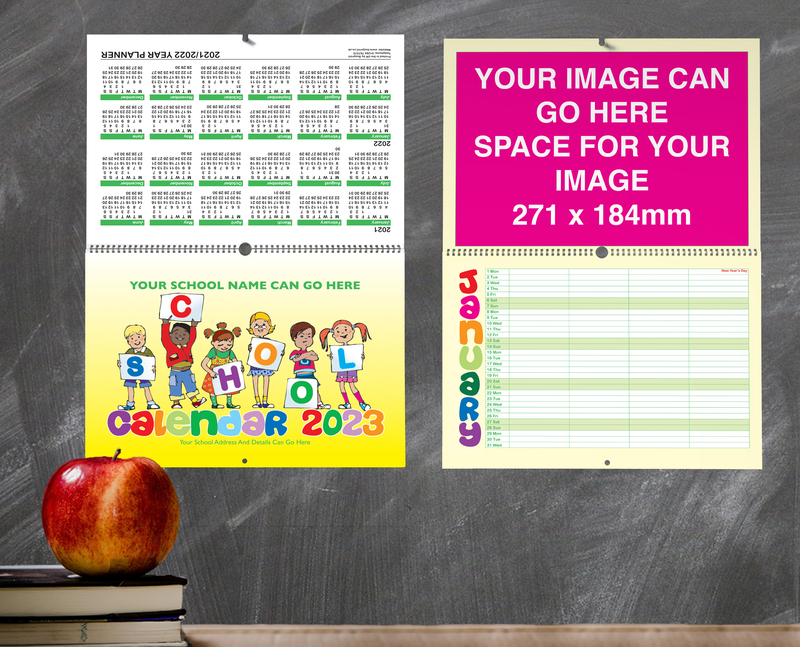 We have done all the hardwork by putting the calendar design together, you can illustrate your family organiser using school photographs or school artwork. Its a very flexible design. The other benefit of using this calendar is that there is plenty of space on our family organiser for business adverts. Find local businesses to advertise on your calendar and sponsor a month.